I want to alert you to a rather unusual event occurring this evening. Many of you already know about the triple shadow transit of Jupiter’s moons Io, Europa and Callisto. That’s scheduled for late tonight. Earlier, around nightfall, the crescent moon will lie 1° or less to the south-southwest of comet 15P/Finlay. No doubt lunar glare will hamper the view some, but what a fun opportunity to use the moon to find a comet. Finlay underwent a flare in brightness last week when it became easily visible in binoculars. 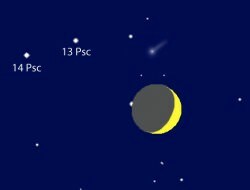 Though a crescent moon isn’t what you’d call a glare bomb, I can’t predict for certain whether you’ll still see the comet in binoculars tonight or need a small telescope instead. Most likely a scope. Finlay has faded some since its outburst and now glows around magnitude +8.5. You can try with a 10×50 or larger glass, and if you don’t succeed, whip out your telescope; a 4.5-inch or larger instrument should handle the job. Just point it at the moon at star-hop a little to the north-northeast using the map until you see a fuzzy spot with a brighter center. 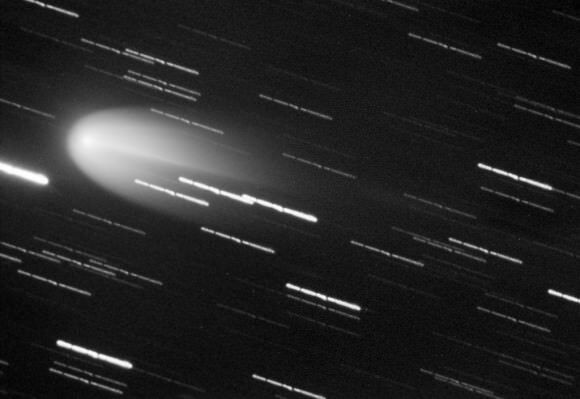 That’s your comet. The tail won’t be visible unless you’re using more firepower, something closer to 10-inches. By the way, the father south you live, the closer the moon approaches Finlay. From the far southern U.S. they’ll be just 1/2° apart. Keep going south and parts of Central and South America will actually see the earth-lit edge of moon approach and then occult the comet from view! UPDATE: Although light clouds marred the view I had difficulty finding the comet this evening in my 10-inch scope. It’s possible it’s further faded or my conditions weren’t optimal or both. No luck BTW in binoculars.